I imagine many of you are eagerly awaiting the opening of the new Museum of the American Revolution in Philadelphia in April. 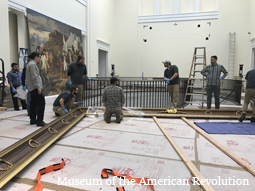 We have been staying in close touch with our partners at the Museum and I’m excited to tell you that the large Siege of Yorktown (1781) painting installation that DAR helped to support is now up! We were pleased to provide a grant to underwrite the majority of the conservation, framing, and installation of a hand-painted copy of the Siege of Yorktown (1781), a monumental 19th century painting by French artist Louis-Charles Auguste Couder. The painting depicts George Washington and French general Rochambeau giving orders during the last major battle of the American Revolution. The striking painting, measuring 14-by-17 feet (16-by-19 framed), was stretched, varnished, framed and hung. 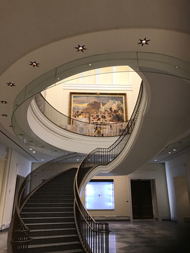 The painting is on the second floor of the Museum, but it is visible from the first floor and will draw visitors up the stairs as they begin their museum experience. Learn more about the painting from the Museum of the American Revolution press release. We are proud to be partners with the Museum of the American Revolution and excited for the increased awareness and educational opportunities the Museum will help bring to the history and continuing relevance of the American Revolutionary War. The Museum of the America Revolution opens to the public on April 19. Tickets to the Museum of the American Revolution will start going on sale at noon on February 22. Learn more here: http://www.amrevmuseum.org/.